The antiquity of Architecture of Karnataka (Kannada: ಕರ್ನಾಟಕ ವಾಸ್ತುಶಿಲ್ಪ) can be traced to its southern Neolithic and early Iron Age, Having witnessed the architectural ideological and utilitarian transformation from shelter- ritual- religion. Here the nomenclature ‘Architecture’ is as old as c.2000 B.C.E. The upper or late Neolithic people in order to make their shelters, they constructed huts made of wattle and doab, that were buttressed by stone boulders, presumably having conical roof resting on the bamboo or wooden posts into red murram or paved granite chips as revealed in archaeological excavations in sites like Brhamagiri (Chitradurga district), Sanganakallu, Tekkalakota (Bellary district), Piklihal (Raichur district). Megaliths are the dominant archaeological evidence of the early Iron Age (c. 1500 B.C.E- 100 C.E unsettled date). There are more than 2000 early Iron Age burial sites on record, who laid the foundation for a high non perishable architecture in the form of various distinct architectural styles of stone built burials, which are ritualistic in its character. The active religious architecture is evident 345 with that of the Kadamba Dynasty. Karnataka is a state in the southern part of India originally known as the State of Mysore. Over the centuries, architectural monuments within the region displayed a diversity of influences, often relaying much about the artistic trends of the rulers of twelve different dynasties. Its architecture ranges dramatically from majestic monolith, such as the Gomateshwara, to Hindu and Jain places of worship, ruins of ancient cities, mausoleums and palaces of different architectural hue. Mysore Kingdom (Wodeyar) rule has also given an architectural master structure in the St. Philomena's Church at Mysore (extolled by the King as a structure of divine compassion and the eager gratitude of men) which was completed in 1956, in addition to many Dravidian style architectural temples. Two of the monuments (Pattadakal and Hampi) are listed under the UNESCO World Heritage List of 22 cultural monuments in India. Styles of Indo-Saracenic, Renaissance, Corinthian, Hindu, Indo-Greek and Indo-British style palaces were built in Mysore, the city of palaces. Sikh architecture at Bidar (1512) and also in Bangalore in 1956 can also be cited as having an impact on the architectural composition of the state. Apart from the ancient traditional Buddhist Viharas which existed in India since ancient times, since the Independence of India in 1947, Karnataka has experienced some marked architectural changes, notably by the influx of Tibetan refugees which arrived in the state between 1963 and 1997, bringing with them the traditional Tibetan art and architectural styles, reflected in the Buddhist monastery at Bylakuppe for instance. Vidhana Soudha (built in Bangalore in 1953) and the tallest temple at Murudeshwar are witnesses to the Neo–Dravidian architectural influences which have evolved since independence. The chronology of the architecture of Karnataka is elaborated in the right-hand box. The Kadambas of Banavasi were the ancient royal dynasty of Karnataka from 345 to 525, and made a significant early contribution to the architectural heritage of Karnataka. Dr. G. M. Moraes opines that apart from using some unique features, the Kadambas incorporated a diversity of styles in their architecture (Kadamba architecture), derived from their predecessors and overlords, drawing upon the architectural tradition of the Satavahanas for instance. The Kadambas were the originators of the Karnataka architecture. The most prominent basic feature of their architecture is the Shikara (dome), called Kadamba Shikara. The Shikara is pyramid shaped and rises in steps without any decoration, with a stupika or kalasha at the top. Occasionally the pyramids had perforated screen windows. This style of Shikara was used several centuries later, having an influence on the Doddagaddavalli Hoysala Temple and the Mahakuta temples in Hampi. The Madhukeshwara (Lord Shiva) Temple in Banavasi was built by Kadambas, and has an intricately carved stone cot. Originally built by the Kadambas, it has undergone, over a period of a thousand years, many additions and renovations, from the Chalukyas to the rulers of Sonda. "Kadambotsava", an annual cultural festival is held here in the month of December. Various temples in the Jaina, Shaiva and Vishnu traditions were built under the Western Ganga Sovereign Dynasty, which was subordinate to Pallava from 350 to 550, under Chalukya overlordship until 753 and under Rashtrakuta overlordship until 1100. The construction of monuments such as Gomateshwara (982 – 983) in places such as Shravanabelagola, Kambadahalli and Talakadu by the Western Ganga kings reflect a tolerance to different faiths. Some Vaishnava temples were built by the Gangas, such as the Narayanaswami temples in Nanjangud, Sattur and Hangala, in the modern Mysore district. Gomateshwara (983), situated in Shravanabelagola is a monolithic statue standing 17.8 metres (58 ft) high above a hill (618 steps climb leads to this monolith), and is visible from a distance of 30 kilometres (19 mi) and regarded as one of the largest monolithic statues in the world. The statue was built by the Ganga minister and commander Chavundaraya (940–989) in honour of Lord Bahubali. Carved from fine-grained white granite, the image stands on a lotus. 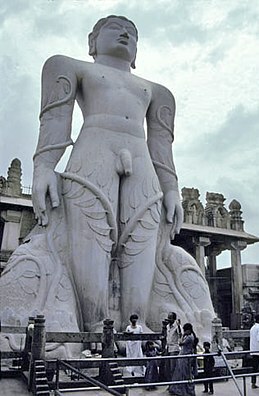 It has no support up to the thighs and is 60 feet (18 m) tall with the face measuring 6.5 feet (2.0 m). With the serene expression on the face of the image, its curled hair with graceful locks, its proportional anatomy, the monolith size, and the combination of its artistry and craftsmanship have led it to be called the mightiest achievement in sculptural art in medieval Karnataka. It is the largest monolithic statue in the world. This is one of the most elegant monuments built in Dravidian, Vesara and Nagara styles during the period between 900 and 1000. The temple, which is oriented to the north towards the Brahmadeva pillar, has five shrines (hence the name Panchakuta). Three shrines are connected to a mantapa by a vestibule and consist of the main shrine of tirthankara Adinatha flanked by Neminatha shrine to the east and Shanthinatha shrine containing a 3 metres (9.8 ft) tall idol of the tirthankara to the west. The other two shrines, which are disconnected and lie to the north of the trikuta cluster (three shrines), are also dedicated to tirthankaras. These are two different monuments. Talakad is a historical site along the banks of the Cauvery River near Mysore. This small town, with a strong history and a prolonged period of human settlement was a flourishing city during the Hoysala period (12th–13th century), and was also an important trade centre during the reign of Gangas (from the 6th century for about 400 years) and Cholas (close of 10th century) and the Hoysalas from 1116. Towards the early 15th century it came under the Vijayanagara rule, and remained with them until the end of the 16th century. There are about a dozen temples spread over a small area of 4 square kilometres (1.5 sq mi), perhaps reflecting the rich art, culture, trade and human activities that once existed there. The town now looks abandoned, except during the time of pilgrimage held once every few years. The temples, whose deities are regularly worshipped, such as the Kirthinarayana Temple, are either uncovered frequently or are protected continuously from accumulation of sand. The sand is removed to uncover them for a specific worship and an important pilgrimage held every five to twelve years; the recent Panchalinga Darshana pilgrimage was held during December 2006. The temple, located at Nanjangud on the right bank of the Kabini River, was originally built in Dravidian style by the Ganga Dynasty rulers in the 9th century during their occupation of this region. It has undergone extensions during the reign of Cholas, Hoysalas, and Wodeyars from the 9th to 19th centuries. It is one of the biggest temples in Karnataka with an area of 560 square feet (52 m2) and with a Gopura (tower) of 36.576 metres (120.00 ft) height, which has seven stories with seven gold plated Kalasas on top of the Gopura. The uniqueness of the temple is that it has 66 idols of Shaiva saints called as Nayanmars and more than 100 Lingas (of different kinds and sizes) including the main deity of Srikanteshwara (Nanjundeshwara) Linga. The main deity is also called Hakim Nanjundeswara; a title given by Tippu Sultan. It is inscribed in the temple history that on Tippu Sultan’s special prayers to the deity, eyesight of the royal elephant was restored, where after the Sultan had a lingam made of jade along with an emerald necklace and donated it to the temple. The architecture is of a temple building idiom that evolved in the time period of 5th to 8th centuries in the area of Malaprabha basin, in present-day Bagalkot district of Karnataka state, sometimes called the Vesara style and Chalukya style. The earliest temples dating back to around 450 in Aihole when the Badami Chalukyas were feudatories of the Kadambas of Banavasi are also reflected during this period. According to historians, the Badami Chalukya contribution to temple building matched their valour and their achievements in battle. Their style included two types of monuments, namely the rock cut halls (caves) or cave temple features and the surface structural monuments. Cave temple architecture is found in the Badami cave temples at Badami, the early Chalukya capital, carved out in the 6th century. There are four cave temples hewn from the sides of cliffs, three Hindu and one Jain, which contain carved architectural elements such as decorative pillars and brackets as well as finely carved sculpture and richly etched ceiling panels. Nearby are many small Buddhist cave shrines. The four caves are simple in style. The entrance is a simple verandah with stone columns and brackets -a distinctive feature of these caves-leading to a columned mandapa and then to the small square shrine (sanctum sanctorum) cut deep into the cave. The temple caves represent different religious sects. Among them, two are dedicated to Lord Vishnu, one to Lord Shiva and the fourth is a Jain temple. The first three are devoted to the Vedic faith and the fourth cave is the only Jain temple at Badami. The Rashtrakutas who ruled the Deccan from Manyakheta, Gulbarga district, Karnataka in the period 753 – 973 created the Dravidian style and Rekhanagara style of architectural monuments. One of the richest traditions in Indian architecture took shape in the Deccan during this time and one writer calls it Karnataka Dravida style as opposed to traditional Dravida style. 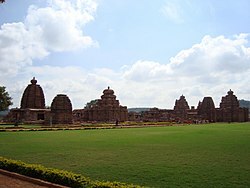 Pattadakal UNESCO World Heritage Site and the Navalinga temples are the structural types of the Rashtrakutas. A group of monuments at Pattadakal, a UNESCO World Heritage Site, is located in the Bijapur district of Karnataka. The temples of this group are the finest structural temples of this period and these are the Jaina, Dolmen, Kadasiddheswara, Jambulingeswara, Galaganatha, Chandrashekhara, Sangameswara, Kasivisweswara, Mallikarjuna, Virupaksha and Papanatha Temples. The uniqueness of this place derives from the presence of both the Dravidian or the Southern and the Nagara or the Northern (Indo-Aryan) styles of temple architecture. Of the ten temples in Pattadakal, six are in Dravidian style and four in Rekhanagara style. The most famous temples are the Virupaksha Temple, Jain Narayana Temple and the Kashivishvanatha Temple at Pattadakal. The best known Virupaksha Temple, earliest of the temples in the Chalukyan series, was built by Queen Lokamahadevi in 745 to commemorate her husband's victory (Vikramaditya II 733 – 746) over the Pallavas of Kanchi. The temple closely resembles the Kailashnatha temple in Kanchi which served as a model for this temple. The Virupakhsa Temple in turn served as an inspiration for the Kailashnatha Temple built by the Rashtrakuta dynasty in Ellora. The Virupaksha Temple is rich in sculptures like those of Lingodbhava, Nataraja, Ravananugraha and Ugranarasimha. It is stated by the Archaeological Survey of India that the tall vimana with axial mandapas and peripheral sub-shrines round the court, enclosed by a wall with gopura-entrances in front and behind were all designed and completed at one time. Adoptions from the Shore Temple at Mahabalipuram in the form of kuta and said–heads has an impressive view from a distance. Sangameshvara Temple built by King Vijayaditya Satyashraya is incomplete, yet attractive. It is the oldest temple built by Vijayaditya Satyashraya (697 – 733) exhibits in its vimana a large degree of the contemporary Pallava temples in the southerly elements, as in the Virupaksha and Mallikarjuna temples. The temple is square on plan from the base to shikhara similar to Virupaksha Temple, has no sukanasika but the vimana has three storeys. The lowermost storey is surrounded by two walls, the inner and outer, the second storey being an upward projection of the inner wall, while the outer wall encloses the covered circumambulatory round the sanctum. 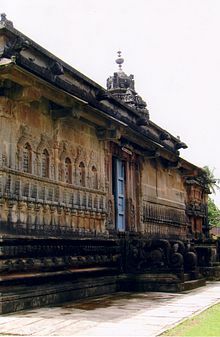 Galaganatha Temple, facing east, built around 750, in the finely evolved rekha-nagara prasada style of architecture contains a sculpture of Lord Shiva killing the demon Andhakasura. The temple, built on a plinth with three highly ornate mouldings, comprises a sanctum (garbhagriha) which a linga and a vestibule (antarala), both surrounded by a closed circumambulatory path (pradakshinapatha), a hall (sabha–mandapa) and an entrance porch (mukhamandapa). The most striking feature of the temple is its well-preserved northern superstructure (rekha-nagara shikhara), topped by amalaka and kalasha. The sculpture housed in this pavilion is that of Siva slaying Andhakasura. The eight-armed god wears a wreath of human skulls (munda-mala) like a sacred thread (yajnopavita) and is depicted as piercing the demon with the trident (trisula). The Papanatha Temple, built around 740, as per Archaeological Survey of India (ASI) records, is in the Vesara style. The temple was started in nagara style but later changed to a more balanced Dravidian style. Sculptures here depict scenes from Ramayana and Mahabharatha. The temple’s plan has a sanctum (garbhagriha) surrounded by a circumambulatory path (pradakshinapatha) with devakoshtha pavilions in its three walls, an ardha-mandapa, a sabha-mandapa and an entrance porch (mukhamandapa) provided with kakshasana. A well-developed rekha-nagara (northern) shikhara with an elaborately carved Chaitya-arch enshrining Nataraja on the frontage of the sukanasa is a special feature at this temple. This temple has many similarities with the Navabrahma temples in Alampur, Andhra Pradesh, which were also built by the same dynasty. Archaeological studies of all the Pattadakal temples show that some have the stellar (multigonal) plan later to be used profusely by the Hoysalas of Belur and Halebidu. Another fine monument at Pattadakal is the Navalinga temple at Kuknur. The Navalinga Temple was built in the 9th century, during the reign of King Amoghavarsha I or his son Krishna II of the Rashtrakuta Dynasty. The temple is located in the town of Kukkanur, 40 km away from Gadag. Built in the South Indian Dravidian architecture style, each of the nine temples in the cluster has a linga, the universal symbol of Hindu God Shiva, and hence the name Navalinga (lit nine lingas). Western Chalukya architecture (Kannada: ಪಶ್ಚಿಮ ಚಾಲುಕ್ಯ ವಾಸ್ತುಶಿಲ್ಪ), also known as Kalyani Chalukya or Later Chalukya architecture, is the distinctive style of ornamented architecture in the Shaiva, Vaishnava, and Jain religious traditions that evolved during the rule of the Western Chalukya Empire in the Tungabhadra region of central Karnataka, in the 11th and 12th centuries. Western Chalukyan political influence was at its peak in the Deccan Plateau during this period. The centre of cultural and temple building activity lay in the Tungabhadra region, where large medieval workshops built numerous monuments. These monuments, regional variants of pre-existing Dravida (South Indian) temples, defined the Karnata dravida tradition. Temples of all sizes built by the Chalukyan architects during this era remain today, known as a transitional style and provides an architectural link between the style of the early Chalukya dynasty and that of the later Hoysala Empire. Lakkundi in Gadag district is a tiny village on the way to Hospet from Hubli. It is one of the fine architectural feasts of the Kalyana Chalukya period (about 10th century). Currently Lakkundi has about 50 temples of various stature and antiquity. All the temples are made of green schist and the outer walls and entrances are very richly decorated. The shikhara is an in-between-style type and the parapet and the artistic division of the wall with pilasters is typical of the south-Indian style. It is also known for Step wells and historic inscriptions. The centre of cultural and temple building activity lay in the Tungabhadra region, where large medieval workshops built numerous monuments. These monuments, regional variants of pre-existing Dravida (South Indian) temples, defined the Karnataka Dravida tradition. A great deal of care has gone into the construction of the Kashivisvanatha Temple in Lakkundi, which deifies Shiva. This temple has a unique feature: a small Surya (Sun) shrine faces the main shrine on the west. There is a common platform between both, which must have been an open mandapa originally. Hence, the Kashivisvanatha Temple has an entrance on the east side and south side of the mandapa. The entrance doorway and the towers are covered with close intricate carvings. The shikhara (dome) is in the North-Indian style and it looks like a lathe must have been used to make the complex circular pillars. Brahma Jaina Basti built by queen Attimabbe is the largest and oldest of many Jain temples in Lakkundi. This temple is dedicated to Mahavira, the most revered saint of Jainism. The temple has a garbhagriha shrine and mandapa style with deep beams on the mandapa from where the eaves are cantilevered. The large Jaina temple, among the many temples at Lakkundi, also near Gadag, is perhaps one of the earliest examples of temples in this area built of a kind of fine-textured chloritic schist as distinct from the hitherto-used sandstone of this region. The new material, because of its less thick quarry-sizes and tractability, reacted on the workmanship, with the result that the masonry-courses became reduced in size and the carvings more delicate and highly finished. The temple, perhaps built in the latter half of the 11th century, has a five-storeyed vimana (tower), square on plan from the base to the shikhara, and had originally a closed square navaranga in front, though an open mandapa was added in front later on. The central bay of the navaranga is a larger square than the peripheral eight around it. The second storey, as in the Jaina temple at Pattadakkal, is functional and has an antarala-mantapa in front over the vestibule of the lower storey. This raises the total height of the vimana considerably. Mahadeva Temple at Itagi in the Koppal district, built in 1112, is an example of Dravida articulation with a nagara superstructure, dedicated to Shiva and is among the larger temples built by the Western Chalukyas and perhaps the most famous. Inscriptions hail it as the 'Emperor among temples'. Here, the main temple, the sanctum of which has a linga, is surrounded by thirteen minor shrines, each with its own linga. The temple has two other shrines, dedicated to Murthinarayana and Chandraleshwari, parents of Mahadeva, the Chalukya commanders who consecrated the temple in 1112. 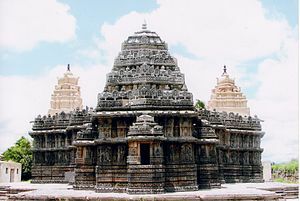 Siddhesvara Temple at Haveri, has a staggered square plan with dravida articulation and superstructure of 11th century vintage, to which some innovative 12th century elements such as aedicules, miniature decorative towers on pilasters, were added. The temple is built of soapstone. The temple bears close resemblance to a few other Chalukyan temples in the vicinity of Haveri; the Muktesvara Temple at Chavudayyadanapura, the Somesvara Temple at Haralhalli and the Siddharamesvara Temple at Niralgi. The entire basement of this temple has sunk by a few feet, making it necessary to descend into the open mantapa (hall). The Dodda Basappa Temple at Dambal, a 12th-century Chalukyan temple, is of the Western Chalukya architectural style. It has a unique 24-pointed, uninterrupted stellate (star-shaped), 7-tiered dravida plan, for the vimana with so many star points that it almost becomes circular in appearance. Each right angle is divided into four 22.5 degrees angles. Then each angle is again divided and covered with intricate carvings. The Trikuteshwara Shiva Temple at Gadag, dated between 1050 and 1200, has ornate pillars with intricate sculpture with three Shivalingas enshrined in the sanctum. It has three lingas mounted on the same stone. Beautifully chiselled stone screens and carved figurines are also seen in the temple. The Saraswati shrine within the Trikuteshwara temple complex has exquisite stone columns. Sudi is famous for rare stone-carved monuments like twin-towered temple with large well built stone carvings. At one time it was a key town of the Kalyani Chalukyas, during 1000. Besides these structures there is a tower (called Hude in native language) located in the centre of the Sudi village. Several stone temples built by Maha Samanthadhipati Naga Deva in 1100 have caught the attention of Karnataka State Archaeological Department. Quite a few of these structures have been cleaned up. The Hoysala architecture style is an offshoot of the Western Chalukya style, which was popular in the 10th and 11th centuries. It is distinctively Dravidian, and owing to its unique features, Hoysala architecture qualifies as an independent style. The Hoysala sculpture in all its richness is said to be a challenge to photography. The artistry of the Hoysalas in stone has been compared to the finesse of an ivory worker or a goldsmith. The abundance of jewellery worn by the sculpted figures and the variety of hairstyles and headdresses depicted give a fair idea of the lifestyles of the Hoysala times. Some of the famous temples of the Hoysala architectural style are the Kesava Temple at Somanathapura, Chennakesava Temple at Belur, Chikkamagalur Amruthapura Temple, Chennakesava Temple at Aralaguppe, the Hoysaleswara Temple at Halebidu, Cheluvanarayana Swamy Temple at Melkote. Somanathapura is famous for the Chennakesava Temple (also called Kesava or Keshava Temple) built by Soma, a dandanayaka (commander) in 1268 under Hoysala king Narasimha III, when the Hoysalas were the major power in South India. The Keshava Temple is one of the finest examples of Hoysala architecture and is in a very well preserved condition. Somnathpur, however, is truly unique in design, perfect in symmetry and the stone carvings are remarkable marvels in stone. The Chennakesava Temple at Belur, originally called Vijayanarayana Temple, built on the banks of the Yagachi River in Belur, an early capital of the Hoysala Empire, is one of the finest examples of Hoysala architecture. It was built by king Vishnuvardhana in commemoration of his victory over the Cholas at Talakad in 1117. The facade of the temple is filled with intricate sculptures and friezes with no portion left blank. Inside the temple are a number of ornate pillars. The temple is about 30 metres (98 ft) in height and has an impressive entrance gopuram (tower), built in Dravidian style. A group of subsidiary shrines surround the main shrine in the centre of a rectangular navaranga (hall). The navaranga (hall) supported by forty-six pillars, each of a different design, has three entrances guarded by decorated doorkeepers. The Hoysaleswara Temple at Halebidu, was built by Ketamala and attributed to Vishnuvardhana. The temple complex comprises two Hindu temples, the Hoysaleshawara and Kedareshwara temples and two Jain basadis. It enshrines Hoysaleswara and Shantaleswara, named after the temple builder Vishnuvardhana Hoysala and his wife, Queen Shantala. The Hoysaleswara Temple, dating back to the 1121, is astounding for its wealth of sculptural details. The temple is a simple dvikuta vimana (two-shrined), one for "Hoysaleswara" and the other for "Shantaleswara" (after Shantala Devi, queen of king Vishnuvardhana) and is built with chloritic chist (also known as soapstone). The temple complex as a whole is elevated on a jagati (platform), a feature that became popular in contemporary Hoysala designs. The walls of the temple are covered with an endless variety of depictions from Hindu mythology, animals, birds and Shilabalikas or dancing figures. Yet no two sculptures of the temple are the same. This magnificent temple guarded by a Nandi Bull was never completed, despite 86 years of labour. The temple of Halebidu, has been described as an "outstanding example of Hindu architecture" and as the "supreme climax of Indian architecture". The Ishvara Temple in Arasikere, dates to 1220 rule of Hoysala Empire. Arasikere (lit "Queens tank"; 'Arasi' means "queen" or "princess" and 'kere' means "tank" in the Kannada language). 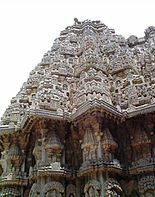 The temple, though modest in size and figure sculpture, is considered the most complex in architecture among surviving Hoysala monuments because of its ground plan: a 16-pointed star shaped mantapa (hall), in addition to an asymmetrical star shaped shrine, whose star points are of three different types. The temple, which faces east like all Hoysala constructions, uses soapstone as basic building material and is a ekakuta shrine (single shrine or cella) with two mantapas, one open and one closed. All three units are connected to form a unity. The elegantly decorated ceilings, the domical ceiling of the open mantapa, the sculptures of Dwarapalakas (door keepers) in the closed mantapa (also called navaranga), the wall panel images numbering 120 (on pilasters between aedicules–miniature towers) carved on the outer walls are noteworthy. The Cheluvanarayana Swamy Temple, located in Melkote built on rocky hills is a square building of large dimensions but very plain, dedicated to Lord Cheluva-Narayana Swamy or Tirunarayana. Mysore Archaeological Department states, on the strength of epigraphic evidence, that the presiding deity of this temple was already a well known idol of worship before Sri Ramanujacharya, the Srivaishnava saint worshipped at the shrine in December 1098 and even before he came to the Mysore region and that very probably he used his influence to rebuild or renovate the temple. The temple is richly endowed, having been under the special patronage of the Mysore Wodeyars, and has a most valuable collection of jewels. The Lakshminarasimha Swamy Temple is a good example of a richly decorated Hoysala temple built in the trikuta (three towers) vimana (prayer hall) style with fine sculptures adorning the walls. The material used is Chloritic Schist (Soapstone) and the temple is built on a jagati (platform) that closely follows the plan of the temple. This is a Hoysala innovation. The Jagati is in perfect unity with the rest of the temple and the temple is built on a jagati (platform) that closely follows the plan of the temple. The size of the original temple can be considered small, to which a larger open mantapa (hall) was later added. The three shrines are located around a central closed mantapa with 9 bays. The ceiling of the closed mantapa is supported by four lathe turned pillars and is deeply domed in the centre. The ceiling of the closed mantapa is supported by four lathe turned pillars and is deeply domed in the centre. The central shrine is the most prominent and has a large tower. This shrine has a vestibule that connects the shrine to the mandapa. Consequently, the vestibule also has a tower that looks like an extension of the main tower and is called the sukanasi or nose. The other two shrines have smaller towers and because they have no vestibule to connect them to the central mantapa, they have no sukanasi. Vijayanagara architecture is a vibrant combination of the Chalukya, Hoysala, Pandya and Chola styles, idioms that prospered in previous centuries. Ruins of Hampi – UNESCO World Heritage Site Virupaksha Temple, Krishna Temple, Vittala Temple, Ugra Narasimha and Kodandarama Temple are some of the famous monuments of the Vijayanagar style. Its legacy of sculpture, architecture and painting influenced the development of the arts long after the empire came to an end. Its stylistic hallmark is the ornate pillared Kalyanamantapa (marriage hall), Vasanthamantapa (open pillared halls) and the Rajagopura (tower). While the empire's monuments are spread over the whole of Southern India, nothing surpasses the vast open-air theatre of monuments at its capital at Vijayanagara, a UNESCO World Heritage Site. In the 14th century the kings continued to build Vesara or Deccan style monuments but later incorporated dravida-style gopurams to meet their ritualistic needs. The Prasanna Virupaksha Temple (underground temple) of Bukka Raya I and the Hazare Rama Temple of Deva Raya I are examples of Deccan architecture. The varied and intricate ornamentation of the pillars is a mark of their work. At Hampi, though the Vitthala Temple is the best example of their pillared Kalyanamantapa style, the Hazara Ramaswamy Temple is a modest but perfectly finished example. A grand specimen of Vijayanagara art, the Vitthala Temple, took several decades to complete during the reign of the Tuluva kings. Another element of the Vijayanagara style is the carving of large monoliths such as the Sasivekalu (mustard) Ganesha and Kadalekalu (Ground nut) Ganesha at Hampi, the Gomateshwara statues in Karkala and Venur, and the Nandi bull in Lepakshi. The Vijayanagara Temples of Bhatkal, Kanakagiri, Sringeri and other towns of coastal Karnataka, as well as Tadpatri, Lepakshi, Ahobilam, Tirupati and Srikalahasti in Andhra Pradesh, and Vellore, Kumbakonam, Kanchi and Srirangam in Tamil Nadu are examples of this style. Vijayanagara art includes wall-paintings such as Dashavathara (ten incarnations of Vishnu) and Girija Kalyana (marriage of Goddess Parvati) in the Virupaksha Temple at Hampi, the Shivapurana paintings (tales of Shiva) at the Virabhadra Temple at Lepakshi, and those at the Jain basadi (temple) and the Kamaskshi and Varadaraja Temple at Kanchi. This mingling of the South Indian styles resulted in a richness not seen in earlier centuries, a focus on reliefs in addition to sculpture that surpasses that previously in India. An aspect of Vijayanagara architecture that shows the cosmopolitanism of the great city is the presence of many secular structures bearing Islamic features. The concentration of structures like pavilions, stables and towers suggests they were for use by royalty. This harmonious exchange of architectural ideas must have happened during rare periods of peace between the Hindu and Muslim kingdoms. The "Great Platform" (Mahanavami dibba) has relief carvings in which the figures seem to have the facial features of central Asian Turks who were known to have been employed as royal attendants. Archaeological Survey of India’s recent excavations in Hampi have revealed a large number of palatial complexes and basements of several platforms including a large number of stone images, beautiful terracotta objects and stucco figures. Ceramics and variety of porcelain and inscribed Buddhist sculptures of 2nd–3rd century have also been unearthed. Islamic architecture in Karnataka evolved during the period of the Adil Shahi dynasty of Indian sultans and Bahamani kings who ruled the Sultanate of Bijapur (1490 to 1686); Gol Gumbaz is the most popular monument of this period. Gol Gumbaz (Kannada: ಗೋಲ ಗುಮ್ಮಟ), of Indo Islamic architectural style, is the mausoleum of Mohammed Adil Shah (1626 – 1656). at Bijapur of the Adil Shahi dynasty of Indian sultans, who ruled the Sultanate of Bijapur from 1490 to 1686. The tomb, located in the city of Bijapur was built in 1659 by the famous architect, Yaqut of Dabul. The construction of this building was completed and the deceased king was interred in this building in 1656 and contains the sepulcher containing the tombs of Muhammad Adil Shah, the seventh Sultan of the Adil Shahi dynasty, his wives and daughters. The structure, built of grey basalt and decorated plaster, consists of a massive square chamber measuring nearly 50 metres (160 ft) on each side and covered by a huge dome 37.9 metres (124 ft) in diameter making it the second largest pre-modern dome in the entire world (after the dome of Hagia Sophia and Pantheon) with thickness varying from 3.05 metres (10.0 ft) near the base to 2.74 metres (9.0 ft) near the top, and has a floor area of 1,703.56 square metres (18,337.0 sq ft). The dome is supported on giant squinches supported by groined pendentives while outside the building is supported by domed octagonal corner towers. The Dome is unsupported by any pillars. The acoustics of the enclosed place make it a whispering gallery where even the smallest sound is heard across the other side of the Gumbaz. Any whisper, clap or sound gets echoed around 10 times. Each tower consists of seven storeys, and the upper floor of each opens on to a round gallery which surrounds the dome. In the centre of the chamber is a square raised podium approached by steps in the centre of each side. The Keladi Nayakas (period: 1499 – 1763) built some fine temples in Ikkeri and Keladi using a combination of late Kadamba, Hoysala, Vijayanagara and Dravida styles. The use of granite for their construction shows that they simply followed the Vijayanagar model of architecture. The Aghoreshwara Temple at Ikkeri and the Rameshwara Temple at Keladi are the best examples of the Nayakas' art. Vijayanagar-style pillars with hippogryphs are common; called yali columns (depiction of horses and lions as seen in Hampi) is found here. These are pillars with lions, either with their forepaws raised or simply in a sitting position, and pillars with a mythical horse-like animal with front legs raised, balancing on its rear legs, and with an armed rider on its back. A roof sculpture depicting a Gandaberunda (see image in infobox), the mythical two-headed bird of Karnataka, symbol of the state, is found in Keladi. At Ikkeri, in the citadel, a palace was built with mud and timber, adorned with carvings. Today what remains is the Aghoreshvara Temple (one of the several names of Lord Shiva), in Ikkeri (was the capital of Keladi Nayakas). It is a large and well proportioned stone-building, constructed in a mixed style with a unique conception. There are carvings and sculptures such as Temple Relief (sculpture consisting of shapes carved on a surface so as to stand out from the surrounding background), erotica, figurines, old Kannada Manuscript, sculpted elephant, etc. There are intricate carvings on the stone walls of the temple. Yalis sculpted on the pillars of the Aghoreswara and Rameshwara temples depict mythical lion and it has been widely used in south Indian sculpture. Description and references to yalis is very old, but its depiction in the south Indian sculpture became prominent from the 16th century as seen in the Nayaka period temples. Yalis are believed to be more powerful than the lion or the elephant. The Rameshwara Temple at Keladi was built in the Hoysala-Dravida style. This temple is made of stone and is on the banks of the Tunga River. The sanctum sanctorum of the temple has a Lingam, which is said to have been installed by Sage Parashurama himself. The Kingdom of Mysore was subordinate to Vijayanagara Empire until 1565 and princely state under the paramouncy of the British Raj after 1799. The architectural designs were in the Indo-Saracenic – blends of Hindu, Muslimor Islamic, Rajput, and Gothic styles of architecture under the Wodeyar Dynasty or Kingdom of Mysore from 1399 to 1947. Indo-Saracenic type is most notably manifested in palaces and courtly buildings built in various styles, and temples built in the Dravidian style. It is the city of Mysore that is best known for its royal palaces, earning it the nickname "City of Palaces". The city's main palace, the Mysore Palace, was designed by the English architect Henry Irwin in 1897. The palace's exterior is Indo-Saracenic in style but the wealth of detail inside is distinctly of Hoysala. Domes, arches, colonnades and carved pillars, as well as its size, add to this palace's notability. The octagonal Kalyana mantapa (Marriage Hall) on the ground floor has 26 canvas paintings on its walls depicting the Dassera procession. On the first floor, a marble staircase leads to a grand colonnaded Durbar hall containing famous paintings, including one of the Hindu god Vishnu on the ceiling. The opulent Amba Vilas hall, with its carved teakwood ceiling, white marble floors, semi-precious inlay work in the Agra style, silver door with a depiction of the dashavatara and dikpalas (guardians), teak doors inlaid with ivory, Belgian stained glass, cast iron pillars from Glasgow, etched glass windows and chandeliers are worthy of mention. The Lalitha Mahal Palace, built in 1921 by E.W. Fritchley in the architectural style Renaissance, exhibits concepts from English manor houses and Italian palazzos, with the central dome believed to have been modelled on St. Paul's Cathedral in London. The Jaganmohan Palace, mostly in the Hindu style built in the middle of the 19th century noted for its ornamental pavilion (called the Wedding Pavilion), and has an elegant façade with three large entrances; the Jayalakshmi Vilas Palace built in the Corinthian style consisting of a three-winged building with two Corinthian and Ionic columns; the sculptures of the Hindu goddess Lakshmi on the north side and of the goddess Bhuvaneshwari on the south side are particularly notable. The Karanji Vilas mansion (1932), an Indo-Greek style building; the Cheluvamba Mansion (1910)- an imposing yet balanced structure, its main façade contains twin towers flanking semi-circular columned verandas on the ground and first floors. The Maharaja's summer palace (1880), is called the Lokaranjan Mahal that initially served as a school for royalty. The Rajendra Vilas Palace (1938) is built in the Indo-British style atop the Chamundi Hill. Other royal mansions built by the Mysore rulers were the Chittaranjan Mahal in Mysore and the Bangalore Palace in Bangalore, a structure built on the lines of England's Windsor Castle. Surrounding the main palace in Mysore and inside the fort are five temples, built in various periods namely, the Prasanna Krishnaswamy Temple (1829), the Lakshmiramana Swamy Temple, the oldest of the fort temples (existed prior to 1499); the Trinesvara Swamy Temple, built for the three-eyed god Shiva, existed since the time of King Raja Wodeyar and was renovated by successive kings; the Shweta Varaha Swamy Temple is unique in that it contains many aspects of Hoysala architecture; and the Prasanna Venkataramana Swami Temple, a Vishnu temple containing 12 murals of the Wodeyar rulers, built by Subbaraya Dasa, an officer of Maharaja Krishnaraja Wodeyar III, in 1836. Chamundeshwari Temple, famous among the kingdom's temples, is located atop the Chamundi Hills about 13 kilometres (8.1 mi) from the palace city of Mysore, over a climb of 1000 steps. The original shrine is said to have been built in the 12th century by Hoysala rulers while its tower was probably built by the Vijayanagar rulers and Wodeyars of Mysore. The temple has a seven story tall ‘gopuram’ (tower built in 1827) decorated with intricate carvings. The idol of the Chamundeshwari or Durga, the fierce form of Shakthi, is called the Goddess of Mysore as it was the tutelary deity of the Mysore Maharajas. It is said to be made of solid gold and the temple gates are made of silver. There is a huge granite Nandi (Bull) on the 800th step on the hill in front of a small Shiva temple, a short distance away. This Nandi is over 4.63 metres (15.2 ft) high, and 7.41 metres (24.3 ft) long and around its neck are exquisite bells. The Shettihalli Rosary Church near Shettihalli, an example of French colonial Gothic architecture built in 1860, is a rare example of a Christian ruin. St. Philomena's Church was built between 1933 and 1956 in honour of St. Philomena in the city of Mysore, India. It was constructed using a Neo-Gothic style and its architecture designed by a Frenchman by name Daly was inspired by the Cologne Cathedral in Germany. A history of St. Philomena's church is provided by Saint Philomena, a saint and martyr of the Roman Catholic Church, is said to have been a young Greek princess martyred in the 4th century. A relic of the saint from Peter Pisani, Apostolic Delegate of the East Indies was handed over to Father Cochet who approached the Mysore king to assist him in constructing a church in honour of St. Philomena. The Maharaja of Mysore laid the foundation stone of the church on 28 October 1933. In his speech on the day of the inauguration, the Maharaja is quoted to have said: "The new church will be strongly and securely built upon a double foundation — divine compassion and the eager gratitude of men." The construction of the church was completed under Bishop Rene Fuga's supervision. The relic of Saint Philomena is preserved in a catacomb below the main altar. The floor plan of the cathedral resembles a cross. The long part of the Cross is the congregation hall called the nave. The two arms of the cross are the transepts. The part containing the altar and the choir is the crossing. The cathedral has a crypt that houses a statue of St. Philomena. The Church has a length of about 50 metres (160 ft) and has twin spires that are 50 metres (160 ft) in height and they resemble the spires of the Cologne Cathedral and also the spires of the St. Patrick's Church in New York City. The Masjid-e-Ala or Jama Masjid was built by Tipu Sultan in 1784 and has minarets mounted on a tall platform. It has two storeys and is octagonal in shape with pigeonholes surmounted by domes. The walls and ceilings are decorated with Persian scriptures in fine calligraphy. Tipu Sultan built the Dariya Daulat Palace in the Dariya Daulat Bhag (literally the "garden of the wealth of the sea") in 1784. Built in the Indo-Saracenic style, the palace is known for its intricate woodwork and paintings. The west wall of the palace is covered with murals depicting Tipu Sultan's victory over Colonel Baillie's army at the Pollilur, near Kanchipuram in 1780. The earliest Sikh Gurudwara in Karnataka is the Guru Nanak Jhira Sahib at Bidar. It was built in traditional Sikh architecture style, at a sacred place located at Bidar in Bidar District. It is also called Nanak Jhira, where Jhira means a spring of water exists. Legend says that Guru Nanak halted here on his way to Sri Lanka in 1512. During that period, people of Bidar were suffering from shortage of drinking water. A fountain of cool water rose out from a hill by the spiritual power of Guru Nanak. A committee took up development work of Gurudwara Nanak Jhira Sahib with the central three-storey building completed in 1966, which encases the historic Nanak Jhira spring divined by Gurunanak. The water of the fountain is collected in 'Amrit-Khud' (a tank of potion), built in white marble. There is a Sikh museum, built in the memory of Guru Tegh Bahadur, depicting the important events of Sikh history through pictures and paintings. There is a Sikh museum, built in the memory of Guru Tegh Bahadur, depicting the important events of Sikh history through pictures and paintings. Built in the Sikh architecture style, the Gurdwara is a lively blend of the Mughal and Rajput styles. Onion-shaped domes, multi-foil arches, paired pilasters, in-lay work, frescoes, etc. are of Mughal extraction, more specially of Shah Jahan's period, while oriel windows, bracket supported eaves at the string-course, chattris, richly ornamented friezes, etc., are derived from elements of Rajput architecture such as is seen in Jaipur, Jodhpur, Bikaner and other places in Rajasthan. Apart from the above ancient Gurudwara at Bidar, Bangalore city also has Gurudwaras dated to 20th century. Guru Nanak, the Sikh Guru, was the first Sikh to visit Bengaluru. On his way back from Sri Lanka he halted at Bangalore. Kempegowda, the builder of Bangalore, met him and sought his blessings. Gurunanak not only blessed Kempegowda but also told him to develop the place. But it took many more years for a Sikh Gurudwara to be built in Bangalore. There are now three Gurudwaras in Bangalore. 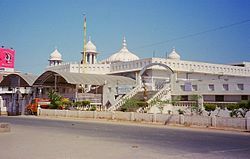 The first Sikh Gurudwara and the largest in Bangalore near the Ulsoor Lake on the Kensington Road, is an elegant and white structure, which was opened on 13 April 1946. It has been renovated recently with marble floors. While under the Mauryas and Satavahanas Buddhism prospered in Karnataka, the influence of Hinduism expanded as it subsumed most of the teachings of Buddha and Buddhism and thus Buddhism lost its distinct uniqueness in the state. However, in the 20th century, Buddha viharas have been established in the State with Bangalore recording two such viharas. The Maha Bodhi Society (MBS) was established by Acharya Buddharakkhita in 1956 at Bangalore with the objective of propagating the teachings of the Buddha and to provide the inspiration and facilities for putting that teaching into practice through spiritual, social, educational activities. The first act of the Acharya was to plant a sampling of the holy Bodhi tree from Bodh Gaya at the premises of the proposed Society. This tree has grown with the Society and is venerated. The Maha Bodhi Society Temple, a relatively new structure, was then built with the main shrine replicating the historic tower at Bodh Gaya. Temple as built is a brick structure with a central tower of 55 m (180.4 ft) height. The Stupa that represents a basic factor in the teaching of the Buddha has also been built at the entrance to the temple, which is made of granite and it enshrines a relic of the Buddha. The temple, the stupa and the Bodhi tree in the temple complex now form a unique landmark in Bangalore. It is a place of worship and meditation, a centre of pilgrimage for people from all over India and other countries. Apart from the Indian Buddhist traditions in the form of Viharas seen in various parts of the country, Tibetan Buddhist monasteries have also made a lasting impact in Karnataka with the influx of refugees from Tibet who were settled in Bylakuppe. One of the famous monasteries is the Namdroling monastery, built as per traditional Tibetan architecture, which is located in Bylakuppe near Kushalnagar in Kodagu in Karnataka. This spectacular Tibetan Golden Temple is a major tourist spot in the area. It is termed the ‘Charming mini Tibet near Madikeri’. Tibetan refugees have both recreated their lifestyle as well as adapted to the local conditions around the monasteries. Huge golden statues, bright coloured wall paintings all around, gigantic dragons on the pillars in a high and big hall are a sight to behold. A lineage of Tibetan Buddhism in the world, the monastery is home to a sangha community of over five thousand lamas (both monks and nuns), a religious college (or shedra) and hospital. The monastery was established by Penor Rinpoche (construction started in 1963 and inaugurated in 1999). Built in typical Tibetan architecture style with Chinese and Indian influences, the monastery reflects a deeply Buddhist approach. It has the Buddhist mandatory Prayer wheel, along with two deer or dragons, same as can be seen on nearly every Gompa in Tibet. Tibetan art, a form of sacred art, in the form of the exquisitely detailed statues to wooden carvings to the intricate designs of the Thangka paintings (a syncrestism of Chinese scroll-painting with Nepalese and Kashmiri painting) are seen in this monastery. In the post independence period (1947 to present) several architectural monuments, in a blend of modern and Dravidian architecture have been built in Karnataka; two impressive structures are the Vidhana Soudha and Murudeshwara Temple. Vidhana Soudha is an imposing building, constructed in a style sometimes described as 'Neo-Dravidian', and incorporates elements of Indo-Saracenic, Rajasthani Jharokha and Dravidian styles. It was completed in 1956. Kengal Hanumanthaiah, the then Chief Minister of Karnataka, took a lot of interest and effort in building this marvellous granite building. It is also called as Taj Mahal of South India. The Murudeshwara Temple, built on the Kanduka hill, is surrounded on three sides by the waters of the Arabian Sea. It is a temple dedicated to the Lord Shiva with a 20-storied Gopura 76.85 metres (252.1 ft), considered as the tallest temple of 21st century. Two life-size elephants in concrete stand guard at the steps leading to the temple. A huge towering statue of Lord Shiva, visible from great distances, is present in the temple complex. Newly constructed Shiva's statue is next to Murudeshwar statue. The statue is 37 metres (121 ft) in height. Typical architectural styles seen in Karnataka are shown in this gallery. ^ ARJUN, R (2014). "Architecture of Karnataka; The Antiquity and the Transformation (From Tekkalakota to Pattadkal)". mySOCIETY. VII (1–2): 26–44. ^ "Architectural Wonders of Karnataka". Retrieved 26 September 2009. ^ a b c "A hymn in stone Speaks of a secular vision". Retrieved 27 September 2009. ^ "World Heritage List". Archived from the original on 30 October 2009. Retrieved 26 September 2009. ^ "Madukeshwara temple". Retrieved 26 September 2009. ^ Dr. Jyotsna Kamat. "Ancient City of Banavasi". 1996-2006 Kamat's Potpourri. Kamat's Potpourri. Archived from the original on 9 November 2006. Retrieved 28 November 2006. ^ Kamat, Suryanatha (1980). A concise history of Karnataka from pre-historic times to the present. Kadamaba dynasty. Archana Prakashana (Bangalore). pp. 37–38. Retrieved 26 September 2009. ^ "Kadambas of Banavsi". Retrieved 26 September 2009. ^ a b "Architectural Wonders". Archived from the original on 23 October 2009. Retrieved 26 September 2009. ^ Keay, John (2001). India: A History. Grove Press. p. 608. ISBN 0-8021-3797-0. Retrieved 26 September 2009. ^ "According to Robert J. Delbonta, who researched the monument, An article in The Hindu". 3 February 2006. Retrieved 26 September 2009. ^ "The Thalakaadu phenomenon: A miracle or an ecological disaster?" (PDF). Retrieved 26 September 2009. ^ a b "Nanjundeshwara Temple". Archived from the original on 29 October 2009. Retrieved 26 September 2009. ^ "Cave 1 Badami, 575 – 585". Retrieved 27 September 2009. ^ Thapar, Binda (2004). Introduction to Indian Architecture. Singapore: Periplus Editions. p. 45. ISBN 0-7946-0011-5. ^ "Indian Architecture Rock-cut". Indian Heritage. Retrieved 27 September 2009. ^ Hardy, Adam (1999). "Indian Temple Architecture: Form and Transformation, the Karnata Dravida Tradition, 7th to 13th Centuries". Artibus Asiae. 58 (3/4): 358–362. JSTOR 3250027. ^ a b c "World heritage sites Pattadakal". Retrieved 27 September 2009. ^ "Galaganatha". Retrieved 27 September 2009. ^ "Papanatha temple". Retrieved 27 September 2009. ^ Arthikaje, Mangalore; Sundara and Rajashekar. "Society, Religion and Economic condition in the period of Rashtrakutas". 1998–2000 OurKarnataka.Com, Inc. Archived from the original on 18 January 2010. Retrieved 27 September 2009. ^ Kamiya, Takeo (20 September 1996). "Architecture of the Indian Subcontinent". Gerard da Cunha-Architecture Autonomous, Bardez, Goa, India. Retrieved 27 September 2009. ^ "Kashivisvanatha Temple, Hindu, 12th Century". Retrieved 27 September 2009. ^ a b c "Brahma-Jinalaya Basti, Jain, 11th century". Retrieved 27 September 2009. ^ Rao, Kishan (10 March 2006). "Emperor of Temples' crying for attention". The Hindu. Retrieved 9 November 2009. ^ "Architecture of the Indian Subcontinent". Retrieved 27 September 2009. ^ "Dodda Basappa temple – 12th century". Retrieved 27 September 2009. ^ "Kalyani Chalukya Temples". Retrieved 27 September 2009. ^ Settar S (12–25 April 2003). "Hoysala Heritage". Frontline. Frontline, From the publishers of the Hindu. Archived from the original on 1 July 2006. Retrieved 27 September 2009. ^ "Somnathpur temple". Retrieved 27 September 2009. ^ "Hoysala Temples of Belur". Retrieved 27 September 2009. ^ "History of Karnataka". Retrieved 27 September 2009. ^ "Academy of Sanskrit Research". Retrieved 27 September 2009. ^ Arthikaje, Mangalore. 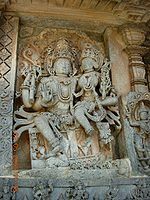 "History of Karnataka-Religion, Literature, Art and Architecture in Hoysala Empire". © 1998-00 OurKarnataka.Com, Inc. Archived from the original on 4 November 2006. Retrieved 27 September 2009. ^ a b "Group of monuments at Hampi (1986), Karnataka". Retrieved 27 September 2009. ^ a b c d "Gol Gumbaz". Retrieved 27 September 2009. ^ "Gol Gumbaz: Mausoleum of Muhammad 'Adil Shah". ArchNet digital library. Archived from the original on 24 October 2010. Retrieved 27 September 2009. ^ "Gol Gumbaz: Mausoleum of Muhammad 'Adil Shah". Archived from the original on 24 October 2010. Retrieved 27 September 2009. ^ "Gol Gumbaz/ Bijapur". The Institute of Oriental Culture, University of Tokyo, Tokyo. Archived from the original on 18 October 2009. Retrieved 27 September 2009. ^ "Ikkeri –sagara (part 2 of some)". Retrieved 27 September 2009. ^ Raman, Afried (1994). Bangalore – Mysore. Mysore Palace. Orient Blackswan. pp. 78–87. ISBN 978-0-86311-431-1. Retrieved 27 September 2009. ^ a b c "Mysore, City of Palaces". Jagan Mohan Palace. 1998-00 OurKarnataka.Com, Inc. Archived from the original on 29 September 2007. Retrieved 27 September 2007. ^ Priyanka Haldipur. "Of monumental value". Jayalakshmi Vilas Mansion. Deccan Herald. Archived from the original on 15 October 2007. Retrieved 27 September 2007. ^ "Chamundeswari Temple of Chamundi Hill, Mysore". Retrieved 27 September 2009. ^ "Chamundeswari HIll Temple – Mysore". Retrieved 27 September 2009. ^ "Saint Philomena's Church Mysore, India (Note: After opening the page associated with this link, click on the link Cathedral of Saint Philomena at the bottom of that page to see the description of the church)". Online webpage of Santuario Santa Filomena. Archived from the original on 9 October 2009. Retrieved 27 September 2009. ^ "Mysore, City of Palaces". Masjid-e-Ala Srirangapatna. Mysore.org.uk. Archived from the original on 10 October 2007. Retrieved 27 September 2007. ^ a b c "White Marble Monuments of India". Retrieved 1 August 2014. ^ De, Aditi (2008). Multiple City:Writings On Bangalore. The Cities Within – New Shoes and Old Roots: The Cultural Backdrop of Bangalore, Part III, Article 9 by Chiranjeevi Singh. Penguin Books India, New Delhi. pp. 49–59. ^ "Hindu Places of Worship". Retrieved 27 September 2009. ^ "The Buddhist Legacy – Buddhism in Karnataka". India Profile. Retrieved 27 September 2009. ^ "Maha Bodhi Society". founder. Archived from the original on 6 February 2010. Retrieved 22 April 2010. ^ "Maha Bodhi Society Bangalore". Home. Mahabodhi Website. April 2010. Archived from the original on 23 May 2010. Retrieved 22 April 2010. ^ "Maha Bodhi Society Temple". Retrieved 27 September 2009. ^ "Maha Bodhi Society". history. Archived from the original on 23 February 2010. Retrieved 22 April 2010. ^ a b c "Charming mini Tibet near Madikeri". Retrieved 27 September 2009. ^ "Namdroling Monastery". Retrieved 27 September 2009. ^ "Vidhana Soudha". National Informatcs Centre. Archived from the original on 18 June 2009. Retrieved 28 January 2010. ^ "World's tallest Siva idol". Retrieved 27 September 2009. ^ "Murudeshwar statue". The Hindu. Chennai, India. 23 January 2006. Retrieved 27 September 2009. De, Aditi (2008). Multiple City:Writings On Bangalore. The Cities Within – New Shoes and Old Roots: The Cultural Backdrop of Bangalore, Part III, Article 9 by Chiranjeevi Singh. Penguin Books India, New Delhi. pp. 49–59. Kamat, Suryanatha (1980). A concise history of Karnataka from pre-historic times to the present. Archana Prakashana (Bangalore).